A new study by the United Nations Human Settlements Programme (UN-Habitat), “World Cities Report 2016: Urbanization and Development – Emerging Futures” has regretted extremely low levels of “aggregate municipal expenditures in India”, which happen to be of the worst in the world. 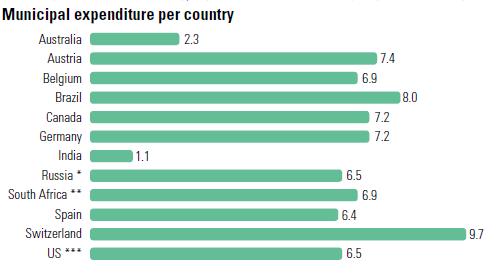 “With only 1.1 per cent of GDP, municipal expenditures in India compare very unfavourably with OECD countries, but even with other BRICS countries such as Brazil, Russia and South Africa. In Latin America, several countries have significantly changed their municipal financial systems”, the report says. “The DMIC involves industry and infrastructure in a 150-200 km band on either side of a 1,500 km dedicated railway freight line. Approximately 180 million people, or 14 per cent of the population of India, will live there. The idea is to develop an industrial zone, with eco-cities spanning across six States, together with industrial clusters and rail, road, sea and air connectivity. “Plans include 24 ‘market-driven’ cities comprising regions with special investment regimes and industrial zones. The scheme places a whole new meaning on the scope and scale of urban economic corridors”, the report underlines. check on the expenses of the so called public servants and India will definitely be on the top!